This luxurious one-bedroom apartment in Barcelona, located in the Poblenou district is the ideal choice for your trip to Barcelona. 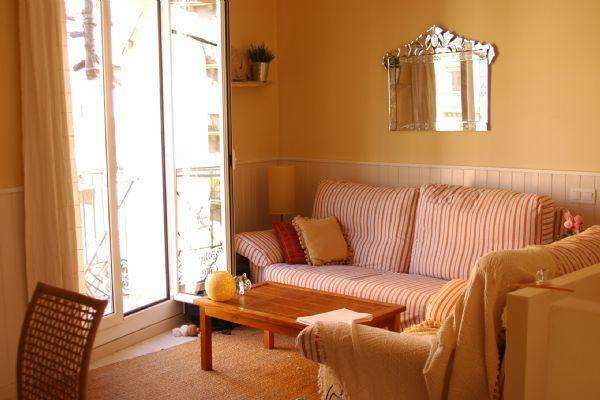 Able to accommodate up to two people, this apartment is a great choice for couples making their way to the Catalan capital. The apartment enjoys a welcoming feel, French windows allow natural light to fill the space throughout the day, while the warm color scheme adds to the homey feel of this lovely apartment. The living room has a comfortable sofa and a TV, perfect for relaxing after a day of sightseeing. Access to a balcony can also be found from the living area, allowing you to look out over this beautiful ´barrio´. The kitchen is fully equipped allowing you to prepare your very own home-cooked meals or try your hand at Mediterranean inspired dishes. The bedroom has a comfy double bed and ample storage space, ensuring that comfort is not an issue on your vacation. The apartment has one bathroom. Complete with heaters and air-conditioning, this charming apartment is the ideal home-away-from-home.